Got into the crappie pretty good yesterday after work. Caught somewhere around 20 crappie, with a few bass and bluegill thrown in. 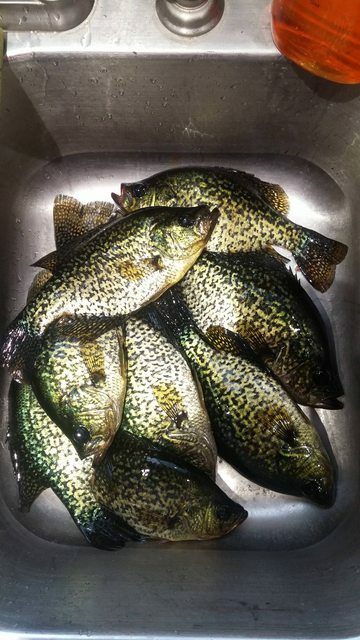 Kept a few of the crappie in the 9 to 12 inch range. Good eats right there. Jealous. I am wading around in the ticks and the brush dog training, mowing, spraying ... You still trout fishing alot too? AverageGuy wrote: Jealous. I am wading around in the ticks and the brush dog training, mowing, spraying ... You still trout fishing alot too? Yeah a few creeks and one river around here I been fishing for trout. I caught a bunch of brookies in a little creek a week or so ago, and some cutties in a river before that. A lot of the river flow levels are just starting to get back down to normal. Some were running at 30,000 CFS just a few weeks ago, with spring break up. Fishing has been good lately. Caught 14 fish this morning (perch, crappie, bass and one sunny). Targeting pike tomorrow, in the canoe. Brownlee will turn on one of these days but that's probably a long drive for you. Those who are fishing at night are doing well but the day time bite is non-existent. It's about 5 hours from me. I used to fish it all the time. Had a 40+ fish day there a few years ago. Crappie, perch, smallmouth, trout. They fish look good. When I filet them crappie I leave the tails holding the filet together. Sometimes I thick the crispy fried tail is the best part. You said spring break up It was 112 here Saturday Otto won't even go outside during the day anymore. I am going back to look at some old hunting threads and day dream for a while. Nice Rowdy! Longhammer, I feel your pain. It's been hot as hades here in Texas this year too. Gotta get out early or late if your going to run your dog. Nice mess of Crappie. Not to many years ago I used to get annual fishing licenses for 3 different states and have fished trout in each one several times by now. This year I haven't even gotten my license in my home state. How times have changed but I think I'm going to buy my PA resident license tonight, hoping to get a chance to wet a line finally a bit this weekend. ryanr, show us some pics if you get out and wet a line. We need something to do in the offseason. I’m going on vacation next week with my family to northwest Montana. We are renting a house on a lake. 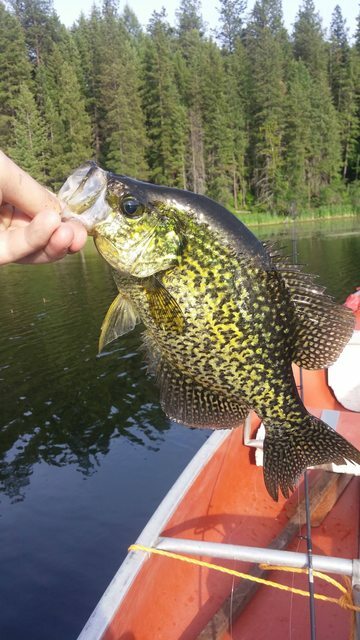 I’m hoping my kids will catch some crappie from the dock, because that will be a first for them (well me too for that matter). I’ve been researching how to de-scale them and cook them up in case we catch a few. Sooty42 wrote: I’m going on vacation next week with my family to northwest Montana. We are renting a house on a lake. I’m hoping my kids will catch some crappie from the dock, because that will be a first for them (well me too for that matter). I’ve been researching how to de-scale them and cook them up in case we catch a few. I keep it simple scale them filet them with the tail left on then add Zatarain's fish fry. fry them till golden brown. Don't be shy about trying the crunchy tail. it can be the best part.